strained milk, stirring perpetually. Add cream and stir till mixture boils. Add salt and pepper. Cook ten minutes, stirring till swish. Sprinkle in cheeses, stirring till swish, to create a Mornay sauce. Place remaining a pair of tablespoons butter in skillet; heat till dissolved. Add shallots; saute till soft and semitransparent. Add spinach; saute till stale. Add liqueur and cut back till mixture reduces significantly and is sort of dry (approximately fifteen seconds), then add 1/2 cup Mornay sauce. Spoon sauce on prime of oysters associated set in an ovenproof pan crammed with rock salt. heat kitchen appliance to 350 degrees. 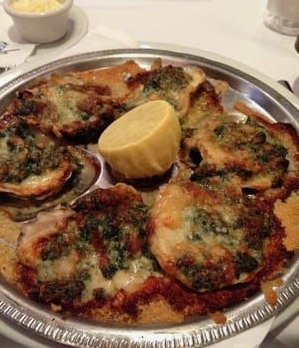 prime oysters with bread crumbs-Parmesan mixture. Bake till golden brown. 0 Response to "OYSTERS ROCKEFELLER"